Our online book printing company’s nationwide customer base from Los Angeles to NYC has given us a 9.4 Trustpilot Rating and a BBB rating of A+. Read our Rave Reviews and try us out for yourself. Thousands of satisfied customers can’t be wrong. Satisfaction Guarantee! We specialize in high quality short run, small and digital book printing in quantities of 10 to 2,000 and bulk offset book printing for quantities over 2,000. Your books can be delivered to your doorstep in 4 to 7 days after proof approval with cheap prices and a satisfaction guarantee! Perfect binding is best for larger page counts (8 pages up to 2” thick maximum). They are inexpensive to make and provide an attractive looking, durable book with a square spine you can print on. Perfect bound books do not lay flat when open. Saddle-stitched binding is the most popular, inexpensive and simple to make yet professional form of binding, which allows us to save you money. Page counts from 8 to 92 pages can be saddle-stitched. They can lay flat and stay open when you are flipping through the pages, which makes it easier to read. Spiral Binding can be up to 2¾ inches thick and Wire-O binding can be 1¼ inches thick. They may cost a little more. 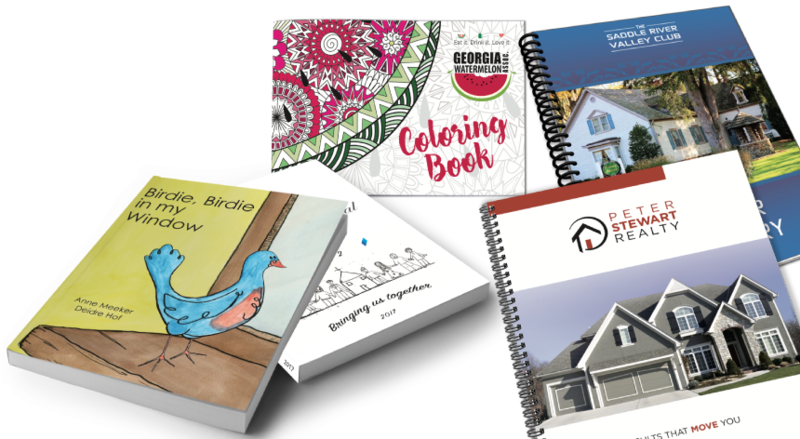 You will love our softcover books printed on 80# or 100# premium gloss or matte text paper stocks with vibrant color. Add 80# or 100# softcover cardstock cover and UV coating to give that luxurious high gloss finish. Upload you design PDF files now to get started! We offer portrait sizes in 8.5 x 11, 5.5 x 8.5, 6 x 9, and 4.25 x 11; landscape sizes in 8.5 x 5.5 and 9 x 6; and square sizes in 8 x 8 and 6 x 6. Custom sizes are also available. You can order 10 or more quantities for your best value from your desktop.